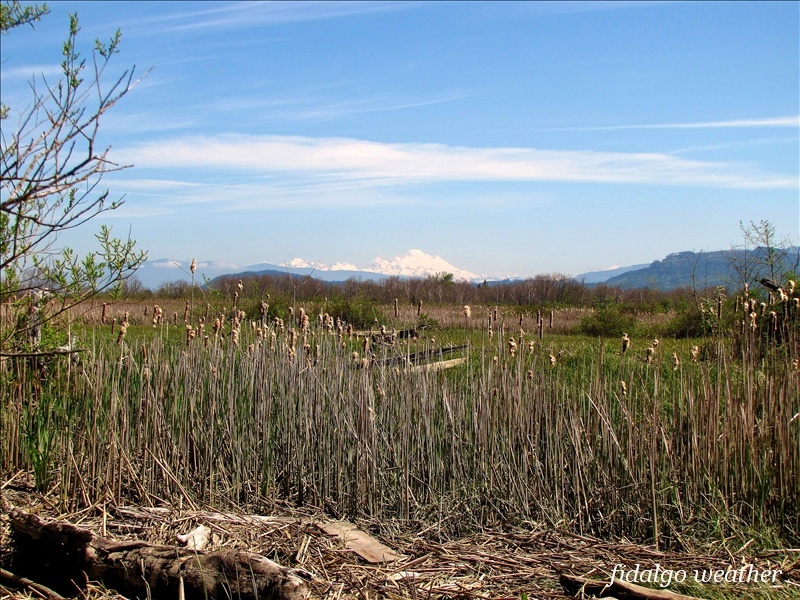 The wetlands of the Skagit State Wildlife Recreation Area are accessible by foot using the Spur Dike Trail. We will start at the Washington Fish and Wildlife Headquarters Unit and walk atop the dike. 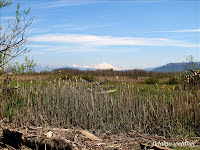 The dike trail extends for about two miles and ends in the marshes bordering Skagit Bay. Right off the bat, there is something beautiful along the edge of the parking lot. This is Saskatoon (Amelanchier alnifolia) a native shrub now in full bloom. It is also the namesake of the Canadian city. You may know it as Serviceberry. It produces edible berries which were highly favored by Native Americans. Along the edge of the dike, we find another native wildflower, Large-leaved Lupine (Lupinus polyphyllus) growing in the more open, sunny areas. You can find the same plant in nurseries. It does very well in my garden, but watch out for slugs and snails. The Wiley Slough Restoration Project is an effort to improve the habitat for the Skagit run of Chinook Salmon. The dikes protecting the island have disturbed some of the natural processes and ruined salmon habitat. The salt marshes required by the salmon have been disrupted. As you know, salmon are born in fresh water streams far from the sea. Before returning to the ocean, the young must spend time in these delta marshes while their bodies become accustomed to salt water. The barrier dike protecting Fir Island farmlands has been moved further inland and another has been removed to the left of the pond above. This adds about 185 acres of ponds and marshes open to both the river and to the sea. Another blooming flower along the edge of the dike is Field Mustard (Brassica campestris). These are not natives, but are ubiquitous along the edges of fields and roads in agricultural areas around here. The wetlands were alive with birdsong of all sorts during my visit. I caught this Song Sparrow (Melospiza melodia) performing his solo. I posted more photos of the singing Wiley Slough Song Sparrows at Wild Fidalgo. The Spur Dike Trail takes you into another world altogether. You leave the civilized United States and enter nature's realm. Only the dike itself and an occasional glimpse of neighboring farms remind the visitor of human existence. As you continue, you will encounter a tide gate and another dike branching off to the right. This is the new barrier dike which was moved further inland. From here on you are in the restored Wiley Slough wetlands. The dike trail also becomes more primitive. The trail is lined with Creeping Buttercup (Ranunculus repens). In the garden, it's a stubborn weed. Out here it's a beautiful addition to the trailside. The trees lining the sloughs are primarily Red Alder, Paper Birch and Willow. The large and dramatic Cow Parsnip (Heracleum lanatum) is a member of the carrot family which will grow to be 10 feet (3 m) tall. Each stem will culminate with a huge, white flower, about a foot across. One of the highlights of the day was this nesting pair of Bald Eagles (Heliaeetus leucocephalus) across one of the large ponds. I spotted this nest last winter, but of course, nobody was home then. One of the reasons for my return visit was to check this nest. Eagles will usually lay two eggs and both parents will incubate them for 35 days. Mount Baker in the North Cascades was in her glory. The volcano last erupted in 1880. Presently, steam plumes can occasionally be seen rising from the summit indicating she is still very much alive. The Cascade chain of volcanoes extends from northern California into British Columbia. It is a segment of the "Ring of Fire" which encircles the Pacific Ocean. Stinging Nettles (Urtica dioica) also add a beauty that belies their vicious nature. Just taking the picture made me itchy and uncomfortable. Some people roll up the leaves and eat them raw which is just fine with me. Formic acid is the cause of my misery from these plants. This is the same chemical that is produced by ants (Formicidae) as a weapon against intruders. Northern Shoveler Ducks (Anas clypeata) were swimming in Wiley Slough. From September to March, this is a duck hunting area. Even off-season, the birds are wary and don't let you get anywhere near them. As the hike continues, the Spur Dike Trail becomes more and more primitive. Wild Pacific Crab Apple (Malus fusca) is now in full bloom. The bark produces cyanide, so don't chew on the twigs. We are now deep in the marshes. There is a mild boggy smell of decaying vegetation and muck. It's a natural, healthy, sulfurous smell, but not generally one we humans prefer. Like I said, we are in nature's realm now. This nature trail eventually becomes more nature than trail. The plant on the right is Common Horsetail (Equisetum arvense). The fossil record dates it to at least 150 million years which means it was trod upon by dinosaurs. 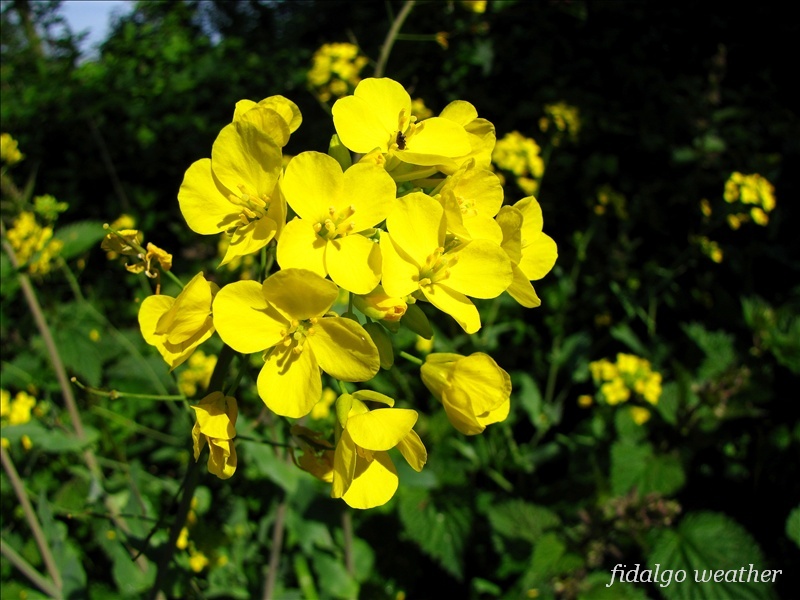 If it comes up in your yard, you can bet you will have difficulty getting rid of such an enduring plant. It also means you have a damp spot. According to Pojar and MacKinnon, it was one of the first to send shoots up through the debris after the Mt. St. Helens eruption. If you are looking for a reference on Pacific Northwest plants, this paperback is a good choice. Salmolnberry (Rubus spectabilis) is a common shrub around the Northwest. Look for it along streams and other moist, disturbed areas. They are also nice looking deciduous shrubs in the native garden. The berries are similar to raspberries, but not to everyone's taste. High levels of vitamin C render a bitter flavor to the fruit. As we approach the end of the trail, the scene opens to the marshes bordering Skagit Bay. We are now in prime Chinook Salmon habitat. At trails end, Skagit Bay is visible, along with the Olympic Mountains beyond. Without the luxury of the Spur Dike to keep our feet dry, this land is too wet and marshy to hike any further. Best to explore the marshes by boat or kayak. There is a boat launch into Freshwater Slough at the parking lot where we began our hike. Check out the Island Wildlife Unit which is only accessible by boat. The flow can be swift, so use good judgement before kayaking. These wetlands are a botanical and zoological paradise. Because of the Spur Dike Trail, they are easily accessible by foot. This has become one of my favorite spots and I hope you enjoyed the visit. Note that a WDFW Vehicle Use Permit is required for access into these facilities. I would suggest ordering a Watchable Wildlife Decal Package which includes the vehicle permit. It also supports state recreational wildlife activities. Happy trails. Thanks for the tour! What a great place to explore and so close by too. Can't wait to check it out this summer. Thanks for visiting my skywatch. You're right about the mothership from that "V" scifi show. The cloud does look rather similar!